I cannot believe it's the middle of October already! That means Halloween is right around the corner: trick-or-treat, candy, scary movies, candy, jack-o-lanterns, candy. Yup, you are going to have a lot of candy on hand. 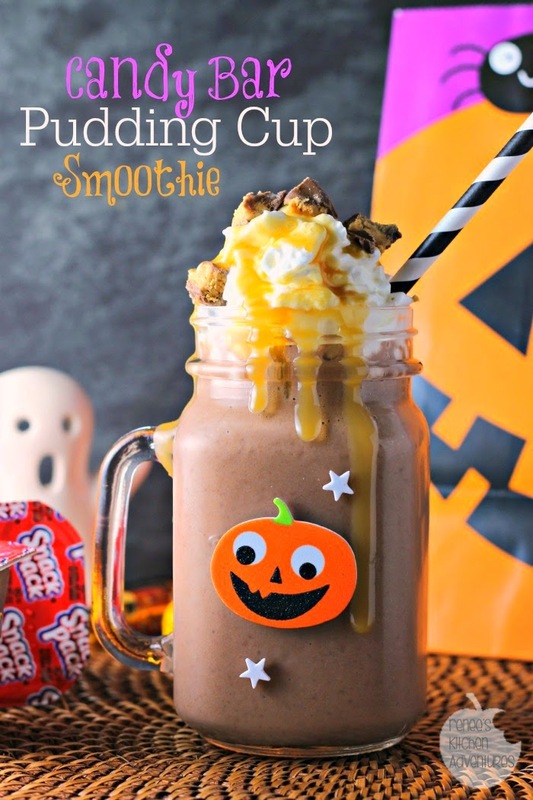 Well, I've got a super fun way to use some of that candy along with snack pack pudding cups! 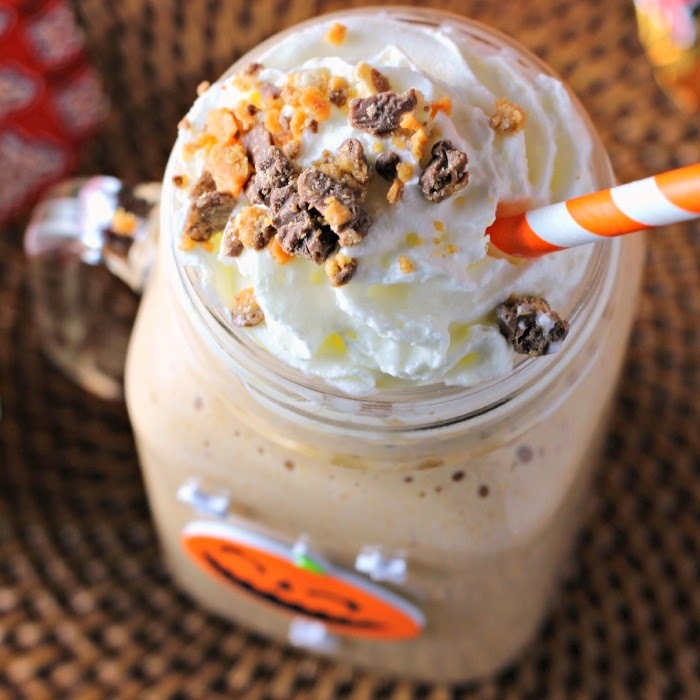 Make some Candy Bar SnackPack Pudding Cup Smoothies! SnackPack pudding not only tastes great but each cup provides the same amount of calcium as an 8oz. glass of milk. When you freeze the pudding cup, you have an awesome base for a tasty smoothie. 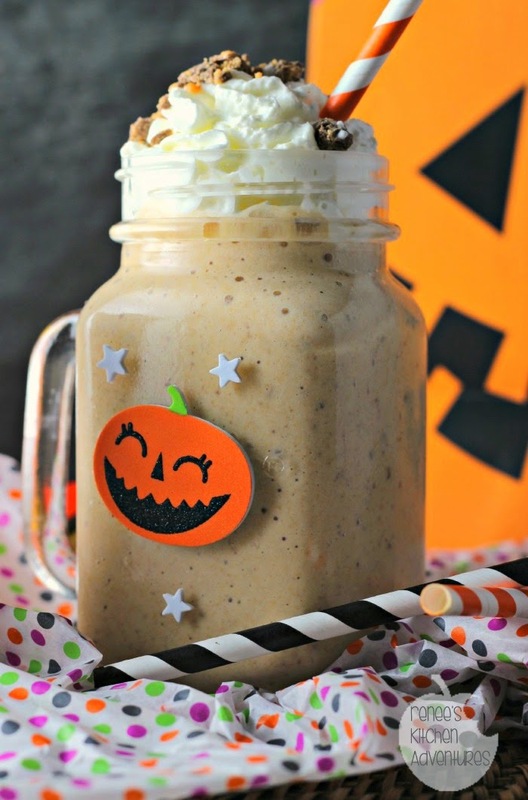 Add in some milk, a banana and your favorite candy bar(s) and you've got yourself a sippable treat. We topped ours with some Redi-Wip whipped cream, more chopped up candy bars, and my son added some caramel syrup to his! YUM! What's great about these smoothies is that you can customize them however you like. I made mine with butterscotch SnackPack pudding cups and a mixture of peanut butter flavored candy bars. My son opted for chocolate SnackPack pudding cups, peanut butter cups candy, and caramel syrup. Both creations were delicious! I knew I could find the supplies I needed to make these smoothies at Walmart. 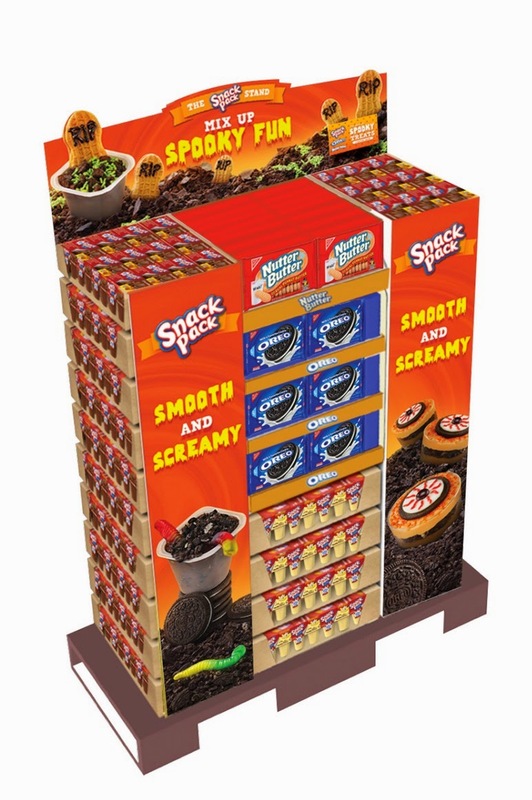 The SnackPack Pudding Cups were located in the aisle with baking mixes and supplies. I popped the pudding cups right into the freezer when I got home. 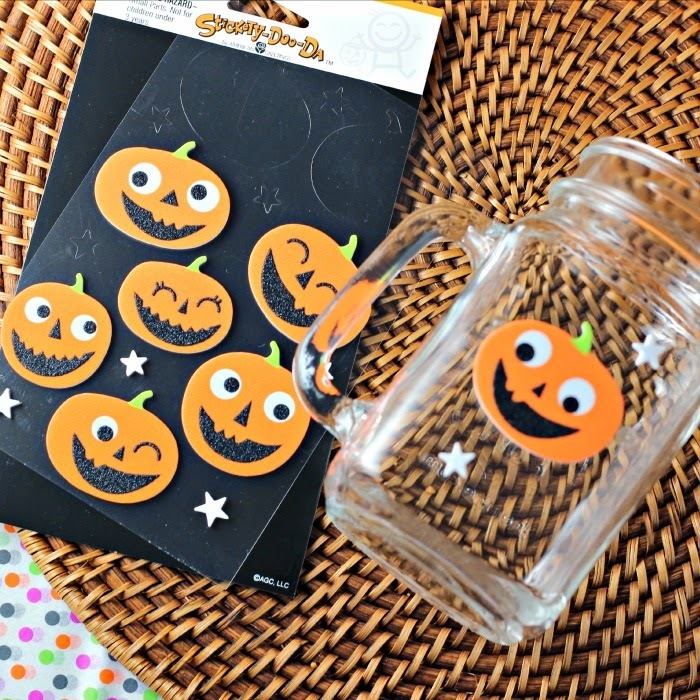 I also picked up some cute Halloween themed stickers to decorate the mugs I served the smoothies in. When the pudding was frozen, I decorated up a few mugs to get into the spirit of Halloween! Next, I gathered up all the ingredients needed to whip up our smoothies: Frozen pudding cups, milk, bananas, fun sized candy bars, Redi-Wip, and caramel syrup. I added all the ingredients I needed to make the smoothie and my high speed blender made quick work of blending up this yummy treat. If you don't have a high speed blender, you might want to chop up the candy fairly small before adding it to the blender. (To make the frozen pudding come out of the cups easier, run a little hot water over the cup before you open it!) 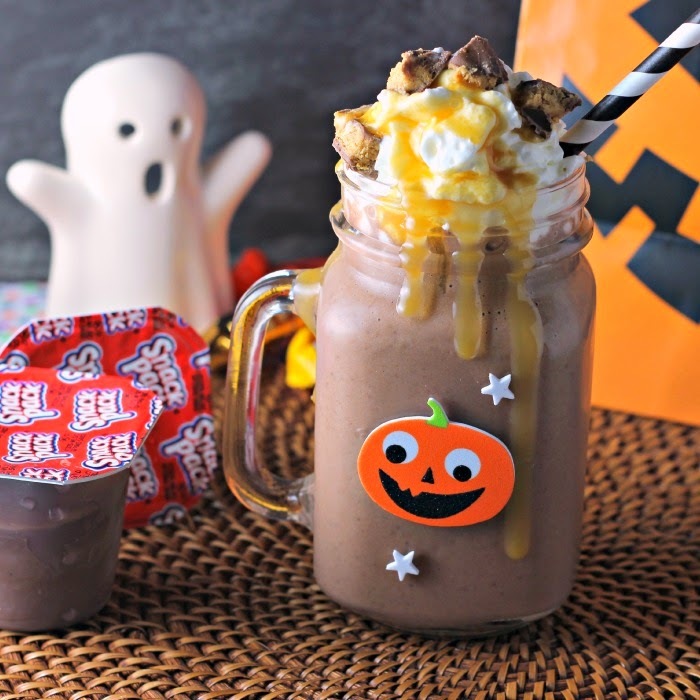 Once it was all blended smoothly, I poured the smoothies into the decorated mugs and topped them with Redi-Wip and some more chopped up candy bars! These smoothies come together in no time and make a really delicious snack or dessert. My favorite thing about them is how you can use whatever flavors of pudding and combinations of candy you desire! What pudding flavor/candy bar combo will you make? 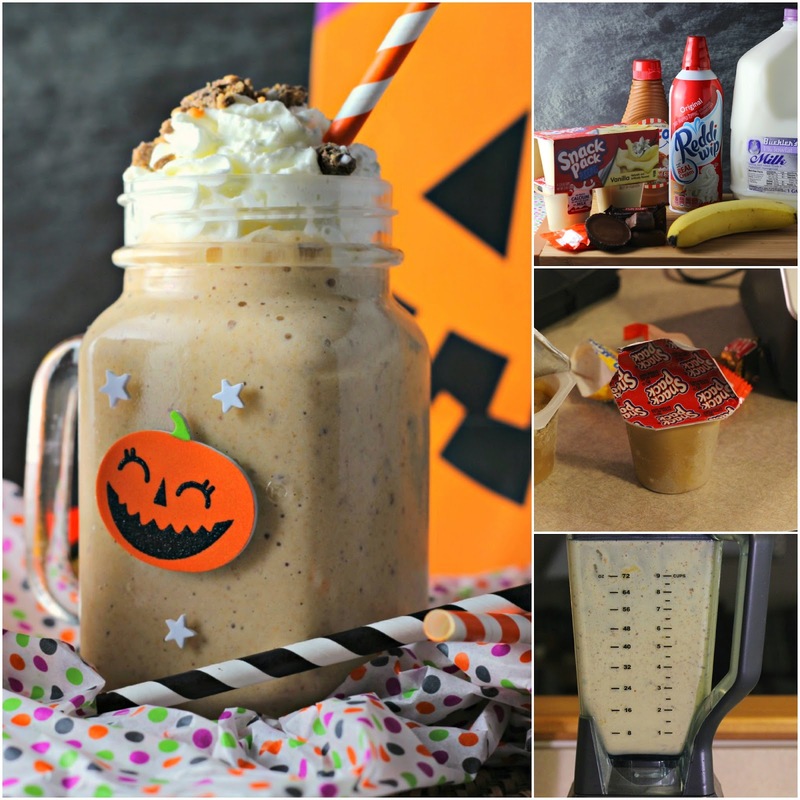 A delicious smoothie using your favorite candy bars, bananas, milk and featuring frozen SnackPack pudding cups! A delightful treat, no trick about it! Pour into cups/mugs and top with Redi-Wip, chopped candy, and syrup, if desired. Serve immediately. Yummm.. This smoothie is a great dessert! Seriously?? This is so, so clever! I would have never thought to freeze pudding cups to make smoothies! :) So much fun! thanks Carrie! Yes, they are really easy, fun and so tasty!